"Terminology with Respect to Prints and Other Multiples"
Buying prints and other works of art created in multiples (or, “editions”) is a great way to start collecting. Not only are they generally more affordable than unique works of art, but they are often accompanied by an active resale market that can be an asset to you as your tastes shift and change. Prints (lithographs, serigraphs, etchings, etc. ), as well as photographs, bronze sculpture, and other objects, can all be made in editions. Learning how to look at multiples can be an enriching learning experience unto itself. Limited Editions. This term should only be applied to editions created in small numbers and to prints, photographs, and other items that are created with the direct involvement of the artist. Some artists work with master printmakers or other types of craftspeople when the craft itself is highly complex, and that is acceptable. But avoid objects that are labeled as a limited edition, yet actually made in large numbers, i.e. 500, 1,000, or more. What constitutes an acceptable number of prints in a limited edition is subjective; I prefer to see editions under 125 or 100, but that is a personal preference. 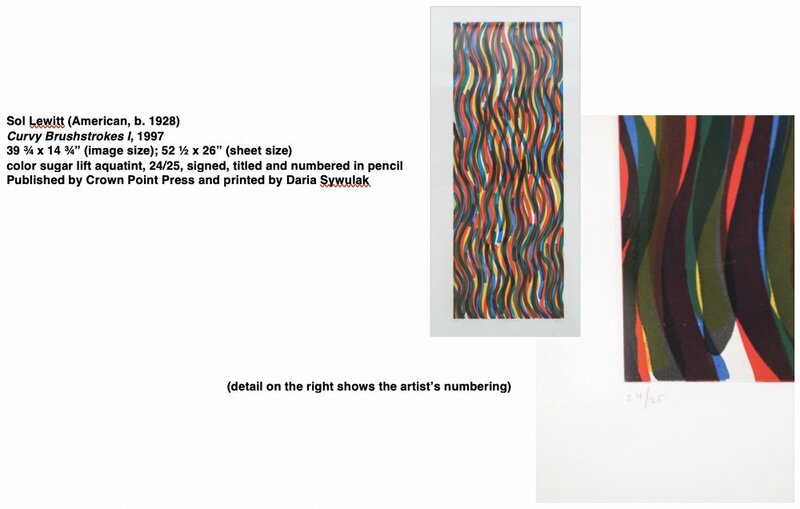 The Sol Lewitt print below is a richly inked plate on heavy paper, and when looking at the plate in person one can clearly see the impression made during the printing process (where the metal printing plate was pressed into the paper). The print is numbered in the lower left corner by the artist “24/25” indicating this print is the 24th made out of an edition of 25. Note: In terms of quality or monetary value, there is no difference between 1/25 and 24/25. There may also be artist’s proofs (numbered “AP”) or other types of proofs in the edition, again, all of the same quality and monetary value. Often times the description of the print will give both a plate size (or “image” size) and a sheet size (or “paper” size) as in the caption above. Certificate of Authenticity: Legally these documents should spell out exactly what you are buying. However, it is important to read and understand the language. Editioned Multiple: This indicates the works were produced in a larger edition, authorized by the artist’s estate or studio, and likely not produced with any direct involvement by the artist. Sometimes the term Authorized Edition is also used. Non-Editioned Multiple: This indicates there is an unlimited number of copies produced and again, likely no direct involvement by the artist. Reproduction: This is an indication the item is a machine-made or mechanically produced copy of a unique work of art. Often there will be printing at the bottom of the sheet and often, pixels are visible under magnification. Signed in the Plate: When an artist’s signature is in the format of an overlay on the image, it may be signed in the actual printing plate and printed on, versus being actually signed by the artist. This could be a sign that the print was created without the artist’s direct involvement. Unique (or, Monoprint or Monotype): These are handmade prints usually created on lithographic stone or plate of which there is only one. In contrast to the general guidelines I have cited, there are high-quality prints with unique (and valuable) characteristics of their own. For example, prints published by Associated American Artists (AAA) during the mid-1930s (and up until the early 1970s) by the Regionalists such as Thomas Hart Benton, John Steuart Curry, Joseph Hirsch, Grant Wood, and others, are Limited Edition prints, but the editions can be as large as 250 and are not always hand signed, numbered, or even printed on high-quality paper. However, they are valuable and tremendously collectible in today’s market. Most collectors of Regionalist prints know, as background, that the AAA was founded by entrepreneur Reeves Lewenthal in response to the so-called “highbrow gallery system” in New York in order to offer limited-edition, affordable prints to America’s emerging middle class during an era of economic depression. This important history adds greatly to the intrinsic value of this type of production. Prices can Vary: When buying multiples, avoid overly stratified pricing structures. When a small, hand-made limited edition is selling quickly, buyers should expect prices to rise in response, and as the edition sells out, the price of the final prints may rise accordingly. But buyers must also be aware of gimmicks. For example, different price points should not be assigned for artist’s signatures “infused with 23-karat gold” or to Artist's Proofs set apart as "Premium" prints or somehow differentiated from the main edition. These stunts are frequently used to lure buyers just starting to collect. They do not help the long-term value of their purchase. Hand-Embellishment: Was the artist of record actually involved in the creation of this artwork? Or is it a Non-Editioned Multiple, hand-finished (or embellished) by another artist and thus referred to as “unique.” This situation applies frequently to giclée prints and to prints of overly sentimental subjects, often found on cruise ships or in shops catering to the tourist trade. Make sure you know what you are buying and that the cost substantiates the quality of the product. Authorized Editions: Recognize that there are important artists who (through no fault of their own) have a market history of muddled attributions and mixed quality. These artists include Marc Chagall, Salvador Dali, Henri Matisse, Joan Miro, Pablo Picasso, Rembrandt van Rijn, and others. While these artists are major European masters, what is frequently for sale as attributed to these artists (at galleries located in tourist towns, on cruise ships, and at some auctions) are not hand-made or original artworks; instead they are later editions, sometimes posthumously produced with the consent of a family member now in control of an artist’s estate. These are often referred to as authorized editions and have little relationship to what was produced by the Artist’s own hand during their lifetime. These artists also have a history of fakes and forgeries found in the general marketplace. Caveat Emptor (or, "Buyer Beware") is a good approach here. Look for a plate mark (indention) in the paper, as shown in this high-quality example of a lithograph by Pablo Picasso. This is a quick way to ensure the print was produced by hand rather than an offset printing press. Look for an actual signature, date, and/or numbers indicating the artist’s direct involvement. Signatures that are printed or “signed in the plate” are no indication of the artist’s involvement. Research the asking price and ensure the price is in line with market standards (especially if you are buying prints in shops that cater primarily to the tourist trade). Consider that an overly large and decorative frame does not add value. Read and fully understand what is stated on any accompanying Certificate of Authenticity. These are works conceived by the artist but created after their death. They could be authorized either by the artist during their lifetime, or, by the estate or studio after death. Value and quality can be variable according to the individual artist, that artist's working process, and the sale situation at hand. It is important to understand the nuances when buying an item created posthumously. 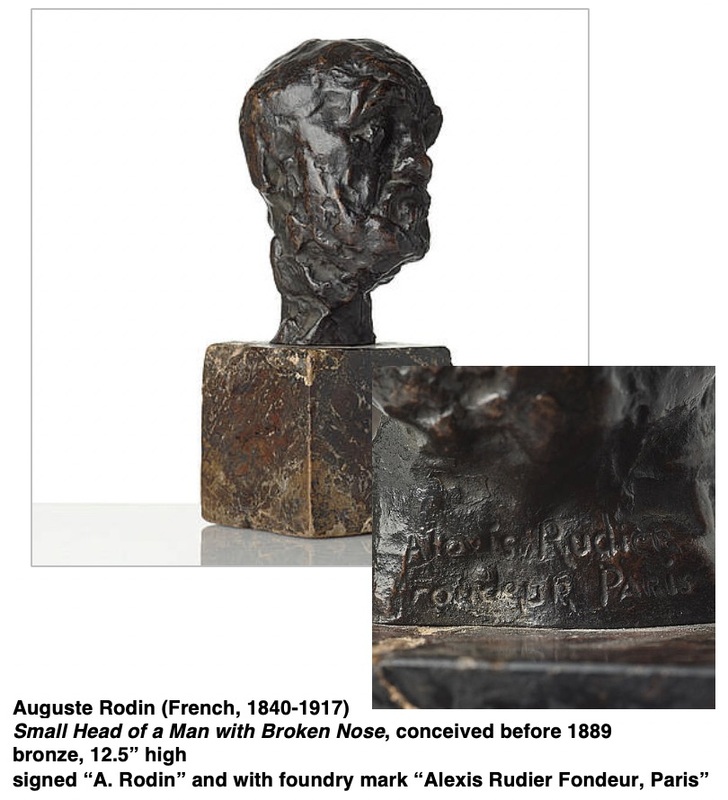 In the case of Auguste Rodin (French, 1840-1917) lifetime casts are preferred, but posthumous casts are widely accepted. If the sales information does not list a casting date, ask. Although it is a complex topic, a reputable dealer should have this information readily available. The Rodin example on the right lists the date as "conceived before 1889" but does not list a casting date. The foundry mark is "Alexis Rudier Fondeur, Paris" which was one of the foundries the artist worked with in his lifetime; a clue, but not irrefutable proof, that it could be a lifetime cast. In this instance Rodin's Catalogue Raisonné or a Rodin scholar should be consulted. The situation is slightly different with Frederic Remington (American, 1861-1909) in that there is some posthumous production that was supervised by his widow and his foundry, Roman Bronze Works, but many lesser quality reproductions tend to dominate the marketplace. In Part 3 of this newsletter (upcoming), we explore specific venues and markets for buying and selling art.